I share a lot on my blog, but what you may not know is that I was a highly sought-after makeup artist back in the 80's. 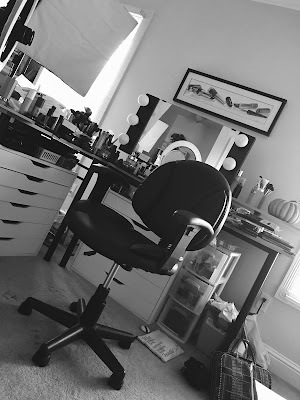 As you can see, I specialized in makeup for men (my dad in particular), and preferred to have my clients comfortable- so I'd just have them lay on the floor. You'll notice that I was a diligent worker... I'd keep going even after they feel asleep! Another key to success is using high quality products- made entirely of plastic. It's hard to mess up when there's no real product in the various containers and tubes! Also, I had my PR team at the ready- always snapping pics of me at work. There you go- those are my keys to success as a makeup artist! Hope you got a laugh out of this quick post! I'm on the go today, but wanted to share this pic of me & dad that my mom found this week. 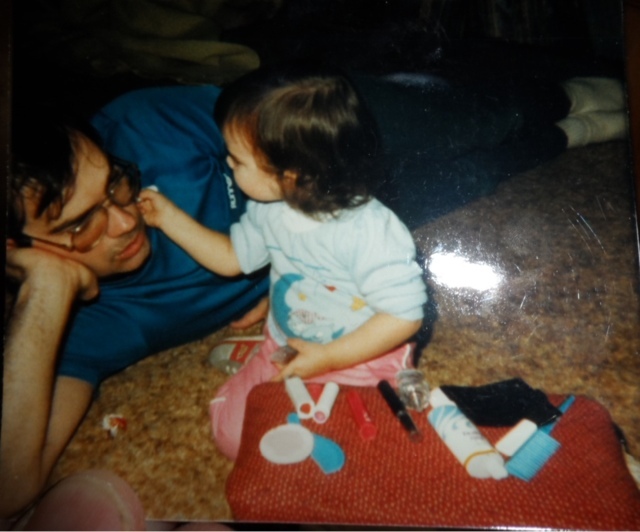 I'm not sure exactly how old I was here, but I definitely remember those play-makeup products! I also remember loving to look through my mom's purse in church to see what kind of makeup she was toting around :) What's your earliest makeup memory? Have a great weekend! I can't remember young I was but I put real makeup on my dad while he was asleep. Of course, I was gentle and didn't know I had put it on him. He wakes up and is hungry for McDonald's. He didn't know he had purple eyeshadow and red lipstick until the girl at the drive-thru pointed it out to him. He wasn't mad, he just shrugged it off and laughed. I miss my daddy. It will be a year in May that he's passed on, but I will always cherish that story. What a cute picture! I remember the first time I feel in love with winged out eyeliner. When I was 7, I was Cleopatra for Halloween. I remember my mom did my makeup to go along with the costume, and she did a fantastic black winged out liner look on me. I was enthralled and thought it was the most glamorous thing I had ever seen! Even though it took about another 9 years before I was allowed to wear makeup everyday, I always remembered how awesome that winged liner looked. I still do it almost every day to some degree! so sweet!!!! you reminded of myself doing the exact same thing.... but my "clients" were my grandmothers, because they were more patient with me!!!!! That is adorable :) When I was 8 I put on one of my mom's red lipsticks while she was at work. That is very cute. My youngest memory is neighbors of mine would give me makeovers which I think they would put on a little blush and lipstick and do my nails. They also would teach me dance routines. I was between 2-4 years old when they did this. I was thrilled to be hanging out with big kids. This reminds me of being a very tiny ballerina, sitting on the counter while my mom put on my makeup for our class productions and recitals. At the time I thought I looked BEAUTIFUL but looking back it would seem that what my mom lacked in skill she more than made up for in color choices. I could've stripped in Vegas and made BANK with the amount of slap that was on my face. lol. This is so cute,I like how you added the the funny post under it.I think I was seven or eight years old,and I want to put on make up like my mom so I grab her eyeliner pencil and eyshadow.I tried to copy her, only to get the eyeliner pencil stuff in my eye.I remember the the plastic lipsticks,and makeup sets as well.Nice post. Mine was with my dad, too. My mom was in the hospital on and off for the first ten years of my life. My dad was amazing about it. He let me paint his nails and put make up on him, and he would actually go grocery shopping in full make up and painted nails. Mine was when I "borrowed" my mom's moisturizer, thinking it was makeup. I was thoroughly dissapointed when I realized that it didn't do anything to my face. I was 5 and used markers to apply makeup in my giant little rag doll.. Fast forward to 6th grade when I tried on my moms sticky Dior glosses in the bathroom! My first makeup memory is doing facials with Merle Norman's Miracol with my momma on Saturday nights. Who knows what Miracol did to my 9 year old skin, but it was fun! LOL Your little "bio" is delightful! Apparently you had such a light touch with your makeup application it put your dad to sleep. I remember being just about that same age, my dad laying on the floor doing his hair up in butterfly clips, makeup and even going crazy with the glitter nail polish. Haha those are some good memories!! I used to rummage through my Mom's make up and always managed to find her setting powders. I was curious every time and would pack that on my face and thought I was looking my best! Lol. Some days, I'd find her bronze/blushes and put that on with absolutely no idea what in the world I was doing so I was tan all over. :D Ah, good times. That pix is the cutest! I bought my daughter play time makeup like that. :) My earliest memory of makeup was buying Tangee Lipstick in the 50's at Woolworth's for 10 cents a tube. It came in a gold metal tube and smelled wonderful! :) It was a bright orange. I was still in grade school but I love to play dress up and put on my orange Tangee lipstick. 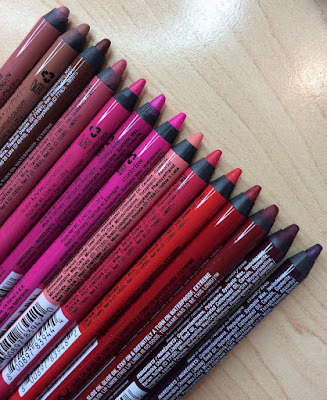 I remember when I was preschool age, I loved going through my mom's extensive eye shadow collection (which is probably where I got my urge to collect eye shadow palettes from). One day, for some reason, I decided it'd be a great idea to swipe a bit of every single color she had onto my eyes. I just remember my mom laughing her head off after she caught me when she meant to scold me. When I was little (4-ish maybe? ), my mom was getting ready one morning when I came in and asked her if she was going to die. It floored her since we hadn't had that conversation at that point. She gave me an elaborate and emotional response. . . . to which I flatly responded "Ok. Can I have your makeup when you die?". My mom has told this story a million times and we laugh about it every time. I distinctly remember her Mary Kay palettes that had interchangable eye and lip trios. I was hooked!! Oh, this is adorable Emily! Thanks so much for sharing. I'm glad I'm not the only one who has been highly addicted to the land of makeup since such an early age!